I was born in Texas, grew up in Texas, and in fact I’ve lived in Texas all my life. And now I write mysteries set in Texas. Sheriff Dan Rhodes (Ghost of a Chance, Minotaur, 2000) patrols a mythical Central Texas county, Carl Burns (…A Dangerous Thing, St. Martin’s, 1996) and Sally Good (Murder Is an Art, St. Martin’s, 1999) teach at Texas colleges, and Truman Smith (Murder Takes a Break, Walker, 1997) lives on Galveston Island. Is Texas part of the Southwest? Sure it is. For years, it was the home of the now-defunct Southwest Conference, which included only Texas schools (plus the University of Arkansas; don’t ask me how Arkansas got in there). 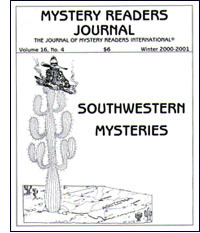 So I feel perfectly justified in calling myself an author of mysteries set in the Southwest. Of course, my version of the Southwest might not be exactly what you’d expect. You don’t get a lot of scenic vistas in my work, not like you get in John Wayne movies about Texas. One of my favorites is The Comancheros, in which Wayne picks up Stuart Whitman in Galveston, and the next thing you know, they’re riding through the mountains. I happen to live about 25 miles from Galveston, and, believe me, there are no mountains nearby. You’d have to drive for hours just to find a hill. I don’t write much about oil barons, either, at least not the kind you see in movies like Giant, which features some of the worst Texas accents ever filmed. Sure, we talk funny (though maybe not as funny as Dan Rather did on election night), and I do have trouble now and then with copy editors, who write insulting comments in the margins of my manuscript. Like, “Would anyone ever actually say something like this?” I hope they all watched Dan Rather. I don’t write much about big cities, either, even though Texas has been an urban state for many years now. Dallas, Houston, and San Antonio are as cosmopolitan and culturally up-to-date as New York, and Boston (well, almost), but there are still plenty of small towns, and my characters live in them. They think of places like Dallas as being fairly remote from their lives. Some of them have probably never even been there. I write about small-town characters because I know them. I’ve lived with them, I’ve worked with them, and I like them. Also, I’m one of them. When I drive into Houston for the day, I never really feel as if I belong there. Too many people, too many cars, too much road construction. And after the recent election campaign, we all know that Houston is the smog capital of America, right? Who’d want to live there? So if you’re looking for mountains, larger-than-life heroes, or nuclear bombs set to go off in fifteen seconds, you might want to read about someone else’s Southwest. If you’re looking for something that’s pretty close to what passes for real life, at least in some parts of Texas, maybe you’d like mine. Bill Crider’s website address is billcrider.com. Northern New Mexico families live together. They look after each other. I’ve known people who turned down promotions if it meant a transfer to Tulsa or Tarrytown or Timbuktu. Cut off from their roots, they would wither. Like Antaeus of old, they draw their strength from the earth itself, the cold caliche of northern New Mexico. Matty’s an unwed mother, as were a number of my students at New Mexico Highlands University on the llano, the high plains east of Santa Fe. If the character of Matty Madrid was born in Santa Fe, it was conceived on the llano. Often, these young women, some, like Matty, black-haired beauties in tight blue jeans and fuchsia tank tops, were the first in the family to go to college or even to graduate from high school. Matty dropped out of Santa Fe High to have her baby, but she picked up a GED along the way. She’s working on a degree at Santa Fe Community College, but it’s a long, hard haul. Is it any wonder Deadly Sin is dedicated to “my students, who have been my teachers”? The baby’s father, Darryl Minguez, is doing eight to ten for gun-running. From his cell at the Penitentiary of New Mexico, Mingo can process more information about crime in the southwest than the NCIC in Washington. In Maximum Insecurity (Avocet, 1999), the first book in the series, Matty investigates an “accidental” death at the pen, uncovering multiple murder and singular corruption. I used to work at the pen, where I was on a first-name basis with rustlers, rapists, and contract killers. Later, I worked for an attorney on contract to the Public Defender’s Office, but that’s a different story… and a different series. Then there are the “Californicators,” jetting to Beverly Hills’ sushi bars, draining ancient aquifers, pimpling the face of the Sangrés with million dollar houses, hacking into the American dream. In Deadly Sin, Matty tangles with a family of wealthy transplants from Marin County. Searching for the Cities of Gold, people like the Quigleys have been coming to New Mexico since 1540. Matty’s own goals are simple: green chile cheese, a cold Tecate, and justice for all. In the City Different, Matty is a woman apart.